Something strange is happening to the super heroes you and your kids know and love. In previous posts I have highlighted a conspiracy that Hollywood is converting its super heroes into ancient gods as of late. If they weren’t already ancient gods to begin with. Thor and Loki are clearly from the Norse pantheon. Aquaman is inspired from the Greek pantheon. And then we have the ancient Babylonian pantheon. We have Batman whom I am convinced Hollywood is converting into Nimrod. There is Wonder Woman whose “real name” Diana is inspired by the Roman goddess. She is now being marketed as Ishtar. Finally Superman has taken on Tammuz characteristics recently. Some of this is has been happening for decades. However I am seeing an accelerated conversion of super heroes into ancient pagan gods. That in itself is quite a fascinating conspiracy as the ancient pagan gods are direct competition to Christianity. If you just understand that last sentence you are smarter than most Christians walking around on the planet. Now new Star Wars movies are being made. Spoiler alert if you have not seen them yet. However you can get by and understand this post without seeing them. I will see to that. Now we proceed. I just wanted to point out that the Bible is aware of the “God of forces” and the “religion of the force”. Now you know. This mosaic is adequately named “Ying Yang 4 by Seth Engstrom” in the real world. Don’t believe me? Google it. 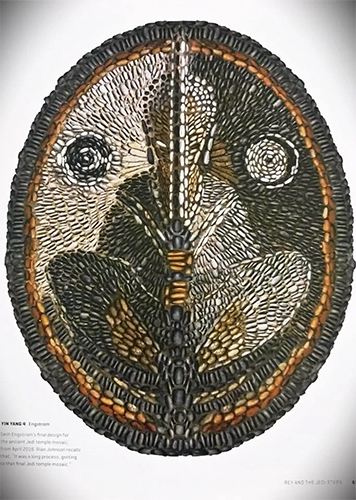 Let us now talk about the yin and yang since it is carved on the Jedi temple floor. It means equal light and dark. It is the same symbolism found in black and white checkered floors. It is the same symbolism “as above so below”. Luke basically quotes it when discussing the evil below the island he lives on with Rey. All of these are hammering home a 50 / 50 balance of good and evil. Make no mistake. There is only one side this concept benefits. Equality benefits the “dark side”. Let me explain. You probably do not realize this but equality between light and darkness is a significant attack on Christianity. There is a history that pre-dates man in the Bible. It is not popular in American culture. Specifically I am talking about Revelation 12. That book describes the recruitment of the fallen angels. In that book 1/3 of the angels were recruited by Lucifer. That would be 33%. At this time I want to point out that Freemasonry worships the number 33. I’m sure that is only a coincidence. So by the Bible the “balance” between light and darkness in the universe would be 66.6% vs 33.3% at the most. Very lopsided. Not even close to 50 / 50. Can a jedi / sith move inanimate objects using the force? Yes. Also known as magic. Can a jedi talk to a dead Obi-Wan? What about a dead Yoda? Yes. They converse with familiar spirits. What do you call a dead Obi-Wan talking to you? Or a dead Yoda? Familiar spirits. What is pantheism? A doctrine that equates God with the forces and laws of the universe. Ladies and gentlemen I am here to tell you there is a religion that practices all these things. It is the New Age. The New Age is the religion of real world witches and warlocks. That may shock you. No one ever just comes out and tells you what real witches and warlocks do. I tell you. They are New Agers. They are not Christians. Hollywood (or perhaps more astutely Disney) has converted Jedi Luke into a warlock. I want to describe what a Christian Jedi would look like to the contrary. A Christian Jedi knows what evil is because they read the correct book. That book would be the KJV Bible. A Christian Jedi sure doesn’t practice evil 50% of the time. Instead your training consists of pushing the boundaries of just how good you can be (where “good” is defined in the book). You will be far removed from 50% evil if you are doing things the correct way. Likely you fall short. However you are constantly pushing your “ceiling of good”. That is what a Christian Jedi would look like to me. They are out there. I hope you are one of them. In direct contrast the new Star Wars is witch and warlock training. One path is how to get saved. The other is how not to get saved. I hope I have adequately summarized this for you.